2017 is an important year for Scotland’s Best B&Bs as we celebrate 21 years since our group was first established. 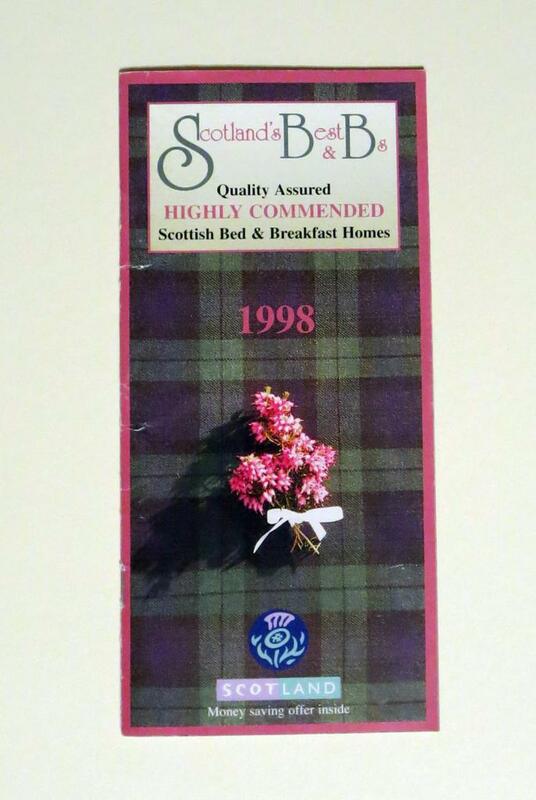 Users of our website and brochure might not realise that the group was founded and is still run by, Scottish Bed and Breakfast owners. It all began in November 1996, when our founder Jacqi Elmslie was inundated by her guests' requests to help them find high quality accommodation for their onward journey. In consultation with Visit Scotland, Jacqui & fellow member Joan Campbell, put together a tartan brochure which included 96 members commended by Visit Scotland. The brochures were distributed to all the participating B&Bs, Tourist Information Centres and sent by post to visitors. From those early beginnings Scotland’s Best B&Bs has become a reliable source of quality bed and breakfast accommodation, with visitors all over the world relying on our commitment to the highest standards of quality and hospitality. None of this would have been possible without the excellent quality and commitment of our B&B owners, 3 of whom have been with us since the very beginning. At this year’s AGM our longest serving members were congratulated and presented with flowers in recognition of their contribution to the group. As the name suggests, Purgavie Farm is a working farm covering 470 acres which has been in Moira's husband David's family since 1904. When Moira first married, she would drive the tractor up the fields to feed the cattle as well as turning and cutting the hay. 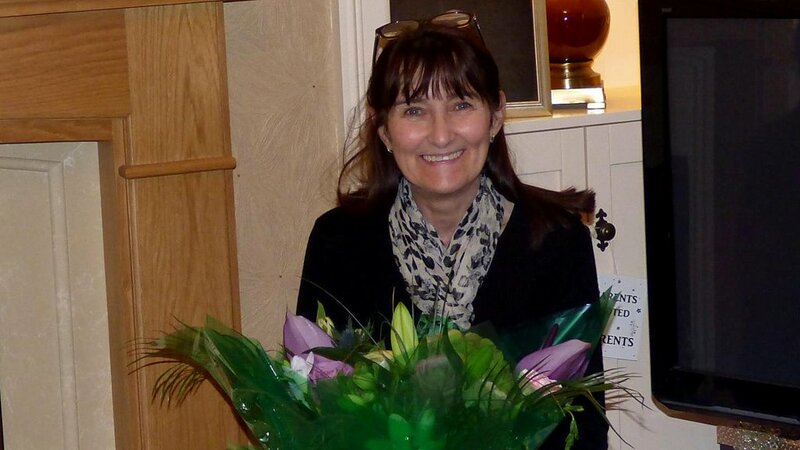 Moira, started her B&B career in 1985 while her two children Allan and Lindsay were young teenagers. Moira remembers in the early days of her B&B, there were no en-suites in the guest rooms, just sinks in the bedrooms and a shared bathroom. Receiving a Commended Grading from Visit Scotland, Moira progressed to first Two and then Three Crowns, and when the Star system commenced, Moira gained 4 Stars and now holds the coveted Taste our Best Award. Purgavie Farm which now has three luxury en-suite guest rooms, is set peacefully in the countryside overlooking the Strathmore Valley and borders the Cairngorm National Park. Moira's son Allan now runs the farm, which allows time for Moira to make handcrafts, knit and watching her granddaughter Erin compete in Highland Dance competitions. Elsie is a farmer's daughter and grew up milking the cows in Lanark and moved to Easter Glentore Farm when she married Alastair 52 years ago. Alastair has lived on the farm all his life, farming sheep and cattle until 1999, when 115,000 trees were planted and nowadays they keep just a few sheep. When they began welcoming guests into their home, their son Iain, then aged 20, would play the bagpipes for their guests and their daughter Una, then 18, chatted with the guests and would play her accordion. In the quieter winter months, Elsie and Alastair enjoy curling and have played since 1979, entering many competitions. They both love a Ceilidh Dance (traditional Scottish country dancing) and have danced once or twice a week since they were married. Elspeth grew up in the fishing village of Helmsdale where her mum ran the family home as a Bed and Breakfast. Elspeth went on to work in the local bank and later married her husband James, known as Jasper. They bought The Clachan, a 1930's villa in Wick with a view to running it as a B&B. 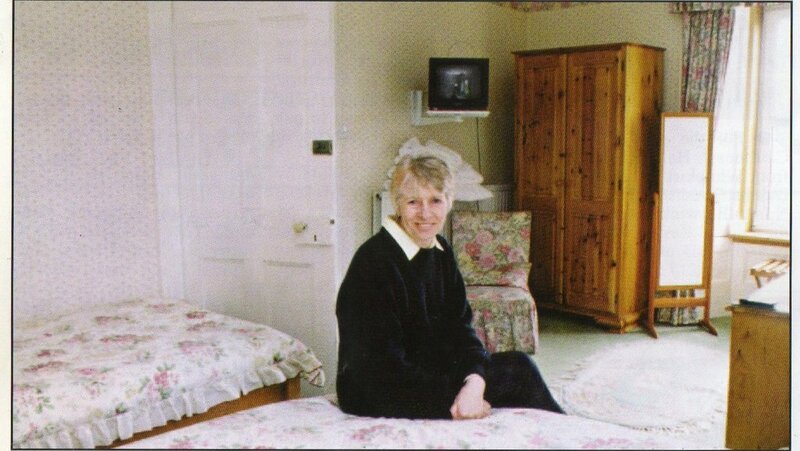 In 1986, when their eldest daughter Lynne was nearly two years of age, they opened their home to guests. Taking a break to have her second daughter, Elspeth reopened the B&B when her baby daughter Avril was just six weeks old. Gaining accreditation from Visit Scotland, The Clachan gained Two and then Three Crowns and later 4 Star Gold status as well as the Taste our Best Award. In the early days, although the bedrooms had sinks, guests shared the family bathroom and later an extension was added to include three ground floor en-suite guest rooms with views to the garden. While Elspeth's two daughters were happy to chat to the guests, Jasper prefers to remain 'back of house' and enjoys maintaining and refurbishing their home to keep it in tip-top condition. 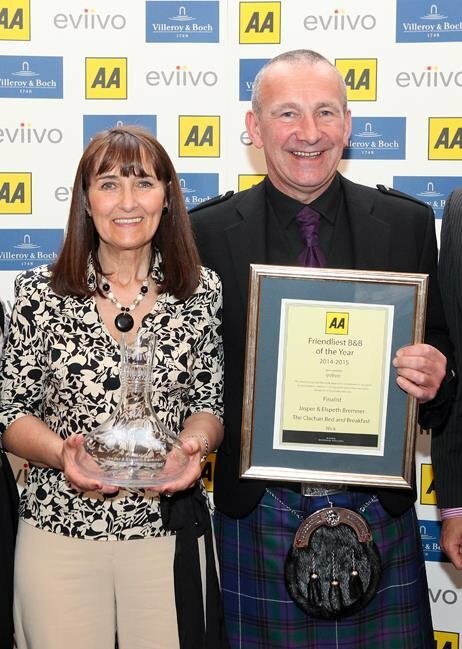 In 2015, Elspeth was a finalist for the AA Friendliest B&B Award and with her husband attended the Award Ceremony in London. With two beautiful grandsons nearby, Archie and Robbie, Elspeth is kept on her toes! When she has a moment to spare, Elspeth likes to take Afternoon Tea with her friends from Scotland's Best B&B's, and sample the local home baking to recommend to her guests. 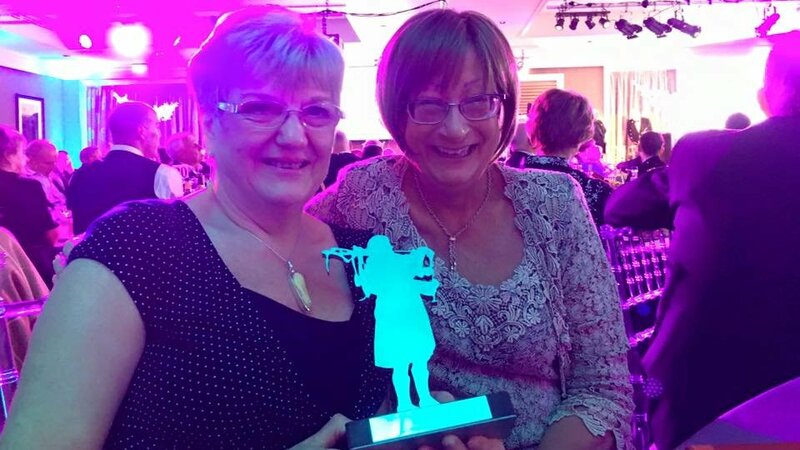 Our Chair Naomi McMahon from Garvally House Guest House and Committee member Janet Crawford from Glengarry B&B were so incredibly proud to receive the ‘Working together for Tourism’ Award on behalf of the entire membership of Scotland’s Best B&Bs at the 2016 Highlands and Islands Tourism Awards.